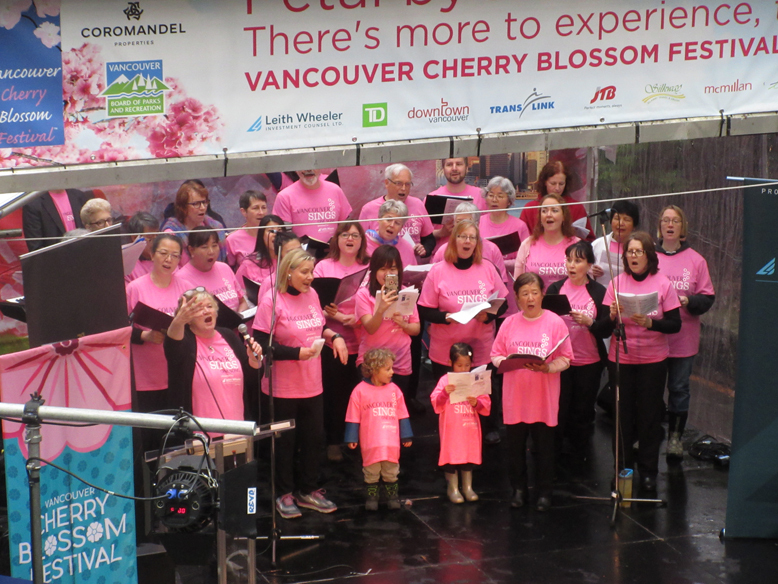 The 12th annual Vancouver Cherry Blossom Festival kicked off today with a noon-hour concert at the Burrard skytrain station in Vancouver. Tetsu Taiko started the show, accompanied by Alcvin Ramos. The performance was amazing, very high in energy. The performance was followed by an original collaboration of Chinese er-hu player Ji Rong Huang with a tap dancer. Kathryn Nicholson lead the Sound Eclectic Vocal Ensemble. The choir performed “Cherry Blossoms For You & Me!” a new song inspired by a haiku by poet laureate Oz Hershfield created especially for the Vancouver Sings One Song event. I’m sure we’ll have the chance to hear it again during the festival and sing it together. At the end of the concert, VCBF Director Linda Poole invited people to check the Vancouver Cherry Blossom Festival website for more information about the many activities (big picnic, tree talks and walks, Sakura illuminations, etc.) and wished everybody a good festival. It was a quite a rainy day in Vancouver. Luckily, the exhibitors tables were in a covered area. Due to the rain, it was pretty quiet under the canopy. Where you would usually find dozens of photographers and a crowd of people admiring cherry blossoms, there were only a few people hanging under the cherry trees. The reason there were so few people under the canopy was clear when you got closer. Turns out half the pathway was flooded. The petals were floating in four inches of water! For those who were not afraid to brave the rain today, the blossoms were there. The Vancouver Cherry Blossom Festival will take place from April 3-29, 2018. Check vcbf.ca for information about the festival activities. Happy Cherry Blossom Viewing!